"The palace of Alhambra," the game of the year 2003 was, globally, together with its extensions to more than 1,000,000 copies sold. Now there is the popular family game for the first time with 5 extensions (each containing four modules) in a large box. This You can use all 20 modules available, which are freely combinable. This means endless hours of fun always new compilations. When I was first introduced to this game by my in-laws, I really didn’t think that I would like it. It seemed that it would be WAY too long for the amount of player interaction that it boasted. A dozen or more games later and I am glad I was wrong. I can’t quite say what it is that makes me want to play yet another round. The scoring is unique, and I love building my city. The expansions in the big box certainly offer different styles of play, though some are rarely used (love using encampments). It definitely has that ‘Euro’ feel and is well worth the time invested. 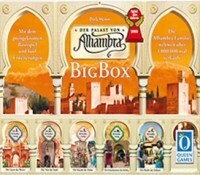 Add a Review for "Alhambra: Big Box"